Musings of a 20-year-old with too many questions about the world. This was something I have been wanting to do for quite some time, but put off due to time constraints. Then, I realised I’ll be forever busy so let’s just heck it and go. We in Singapore love to complain about how we only have so few media outlets and how the media scene is not diverse enough. We hold The Online Citizen in high regard for reporting alternative news simply because the main papers haven’t grasped “the fourth estate” mentality yet. But other than TOC & TR Emeritus (let’s hope they don’t change their name again), our news sources are limited, even in the online realm. Since being in Popspoken, I have encountered many other news and feature websites that not only add their two cents worth to important topics, they also are able to cater to niche audiences and garner a strong, albeit small, following. These can be blogs as well but they are not personality blogs, for the purposes of traditional news reportage. What’s sad is that had I not been a part of Popspoken, I would not have found out all these brilliant sites and populated my Facebook news feed with them. These sites were delivering great content and could potentially rival mainstream press for a slice of the advertiser pie. 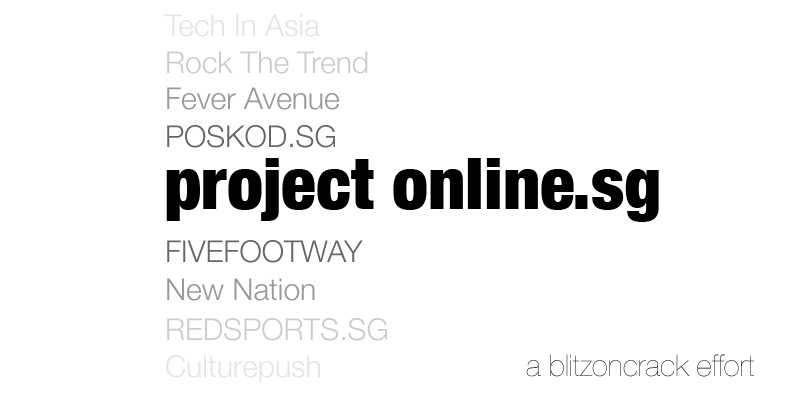 There was just one problem: these sites have not gotten the credit that they received because they are not as visible to Singaporeans. My aim is to reverse that. Yes, humble me with this blog that barely breaks 50 unique views per day. I want to do this because no one is documenting what could potentially be a missing piece in the mainstream media trying to plug too many holes. But most importantly, I’m doing this because I love journalism and I love how these sites are doing pure, honest journalism (and some clever satire) even though they may not receive the advertising dollars that personality bloggers receive. I will curate lists about blogs and online media portals catering to different beats: politics, business, entertainment, culture, fashion and sports. I’ll do one-off pieces for each site (although this may take a while) and maybe speak to the editors. I’ll host them up on the sidebar and build an infographic of these sites. The aim is that by the end of 2012 – if we do die a horrible Mayan death – that the message sent is clear: online is here, online is everywhere and online will stay. It is my hope that Singaporeans will learn to appreciate the choices around them and the depth and integrity of these outlets. We don’t give enough credit to ourselves as a nation for the great things we do and it’s such a shame that these sites could disappear in a year or two because they are not supported by readers and advertisers and therefore, segue into oblivion.